Dr. Rebecca Hirst joined the TILDA research team as a post-doctoral researcher in January 2019. Her current research focuses on individual differences in multisensory integration in ageing. Prior to joining TILDA, Rebecca completed her BSc in Psychology and Cognitive Neuroscience in the UK at the University of Nottingham. In 2014, she graduated from her undergraduate degree and obtained a four-year scholarship from the Economic and Social Research Council (ESRC) to study an MSc in Psychology research methods and a PhD at the University of Nottingham. In 2017, she obtained an ESRC grant to also work as a visiting scholar at Macquarie University, Sydney, validating portable electroencephalography (EEG) for use in research. 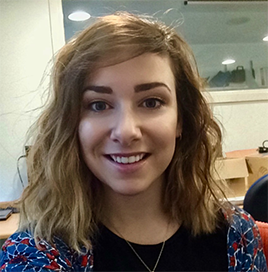 Rebecca completed her PhD in 2018, which focused on multisensory integration and attention in both development and ageing using psychophysics, cognitive tasks, EEG and meta-analytic approaches. Hirst R.J. Stacey J.E., Cragg L., Stacey P.C., Allen .H.A. (2018) The threshold for the McGurk effect in audio-visual noise decreases with development. Scientific Reports. 8(1). 1-12.